Located in the heart of Louisville, KY, the Muhammad Ali Center features three levels of exhibits and galleries. An international cultural center with a museum experience, it shares Muhammad Ali’s legendary life and legacy and invites visitors to reflect upon their own values, inner strength, and what makes them great. Video Solutions Inc. of Louisville was recently tasked with upgrading control systems, displays, playback devices, and servers across the center. Visitors are introduced to the center’s exhibits in the If You Can Dream Orientation Theater. An inspirational 14-minute film is displayed on five screens in the immersive environment, providing an overview of Ali’s life and introducing visitors to his six core principles, organized in individual pavilions. Visitors get to track Ali’s success in the ring with the film, “The Greatest,” which is projected onto the floor of a boxing ring and viewed from a mezzanine level. “Ali All the Time” offers visitors the opportunity to view 15 of his most famous fights on demand. 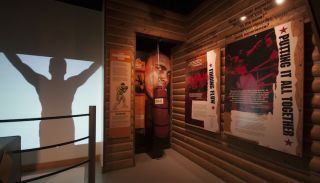 In the interactive “Train with Ali” exhibit, a recreation of Ali’s Deer Lake, PA training camp, visitors can shadow box with The Champ, practice their rhythm on the speed bag, and feel the power of an Ali punch on the heavy bag. Finally, the Lighting the Way Theater relives Ali’s lighting of the Olympic torch in Atlanta in 1996. The center also includes two art galleries, The Howard L. Bingham Gallery and the LeRoy Neiman Gallery. A/V Binloop HD players are used in the If You Can Dream Orientation Theater, Lighting the Way Theater, and for “The Greatest” film, all of which require synchronous playback of content on multiple screens. Digital Video Machines are deployed for the six stations featuring “Ali All the Time” content on demand. They are also used “Train With Ali” and to show a film about photographer Howard L. Bingham in the gallery named for him.